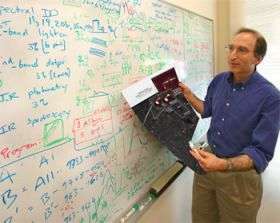 Saul Perlmutter, pictured here, and the members of the Supernova Cosmology Project share the 2007 Gruber Cosmology Prize with their competitors, the High-Z Supernova Search Team, in the discovery of the accelerating expansion of the universe. The 2007 Gruber Cosmology Prize has been awarded jointly to Saul Perlmutter of the Department of Energy's Lawrence Berkeley National Laboratory and the University of California at Berkeley, Brian Schmidt of the Australian National University, and members of the two international teams that these researchers led in discovering the accelerating expansion of the universe -- the Supernova Cosmology Project and the High-Z Supernova Search Team. "The Gruber Cosmology Prize is a great honor for all of us in both teams," says Perlmutter. "It's rare that a scientific prize is able to include a very large number of those in the community whose work actually became the underpinnings of the discovery being celebrated. Yet with the exception of a few notable contributors, that's the case here -- and that's terrific." The announcement by both teams, early in 1998, that the expansion of the universe is not slowing, as almost all astronomers had expected, but instead is expanding ever faster, led to the realization that the universe is dominated by a mysterious something that stretches space and works against the mutual gravitational attraction of ordinary matter and energy. Dark energy, as it was soon named, is now believed to constitute some three-quarters of the density of the universe, with dark matter making up most of the rest. "It was a crazy result that was hard to accept," states the Gruber Foundation in announcing the 2007 Cosmology Prize. The Foundation emphasizes the teams' intense competition to determine the expansion rate of the universe, based on their observations of distant supernovae. "Yet, two teams, racing neck and neck, simultaneously came to the same conclusion." Astronomers had first proposed using supernovae to measure expansion in the 1930s, but it was not until the mid-1980s that bright Type Ia supernovae were determined to be highly dependable standard candles, visible across great distances. Since supernovae explode without prior notice, however, only once or twice per century in a typical galaxy, a way still had to be found to collect large numbers of distant Type Ia supernovae for cosmological measurements. The Gruber Cosmology Prize citation underscores the teams' application of "new techniques that use supernovae exploding within distant galaxies to measure precise distances across a large fraction of the observable Universe." The Supernova Cosmology Project contributed several such innovations, including the key technique that, by 1994, allowed them to prove that they could schedule telescope time in advance and guarantee "supernovae on demand." To do this they used a new observing approach that reliably produced batches of high-redshift Type Ia supernovae, comparing pairs of matching images taken three weeks apart -- the latter just before the new moon -- and each pair including many target galaxies. Every observing session resulted in the identification of numerous Type Ia's caught while still growing brighter. "Today's recognition by the Gruber Foundation is deeply gratifying," says team member and astronomer Greg Aldering, of Berkeley Lab's Physics Division. "Collaborating in such a surprising and fundamental discovery is a reward beyond compare, and this prize serves to celebrate the thrill and import of what seemed, at the time, but a humble endeavor." Having spent eight years on supernova searches and measurements, physicist Gerson Goldhaber, also of the Physics Division, recalls the moment a pattern finally emerged: "I was amazed when I stared at the graph we had just drawn. We had set out to measure the deceleration of the universe, and found it was accelerating. This was one of the eureka moments I have been privileged to observe." Physicist Alex Kim of the Physics Division says, "Making the experiment work was a concentrated group effort. We plan to continue making equally important discoveries in our ongoing and future supernova cosmology experiments." Says team member and astrophysicist Peter Nugent, of the Lab's Computational Research Division, "It's so nice to have a result where you can sit down with a fifth grader and they can understand it. You don't have to teach them general relativity to explain to them how you measure distant supernovae and find out whether they are slowing down or speeding up. As for the Gruber Prize itself, it's wonderful that they are rewarding the whole team -- that's a rare thing in the world of scientific prizes." Team member Reynald Pain, now of the Laboratoire de Physique Nucl¨¦aire et de Hautes Energies in Paris, agrees: "The fact that the collaboration is explicitly named is an encouragement to young researchers to get together and start a project." Pain also sees the Prize as a boost for international cooperation. "The Gruber Cosmology Prize is very good news for the collaboration of French teams with Berkeley Lab, and should lead to stronger support for future dark energy projects." Supernova Cosmology Project cofounder Carl Pennypacker, now with the University of California at Berkeley's Space Sciences Laboratory and a guest in Berkeley Lab's Physics Division, recalls that in the beginning, "the most striking part of the project was the huge skepticism" -- not only about proposed techniques but even about the underlying science. "Nobody believed we could do it, and it was an enormous challenge to get things done."